This red blend is the wine equivalent of the party hat! It is festive, fun, always easy to enjoy, and ready for anything. Soft and fruity best describes Artisan Red. Lively, youthful fruit reminiscent of strawberry and licorice candy are found on the nose. Soft tannins and lower alcohol make this our most easy drinking red wine. Party hats are not often meant for years of use or storage, and neither is Artisan Red. It will certainly hold its own until your next big shin-dig, but will be best if consumed within 2 years. 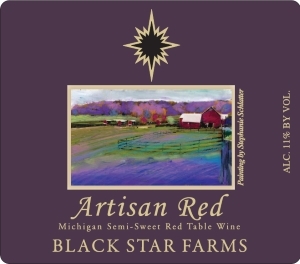 Artisan Red goes well alongside many festive foods from brats to burgers or ribs on the grill, with flavorful pastas and deep dish pizza. Try it with jambalaya, chili con carne, or even a spicy Asian dish. The splash of sweet will help cut the spices in these dishes and the fruitiness will enhance the flavors. This is a fun and fruity wine, it is one of those no hassle easy drinking wines that can be served at room temp or slightly chilled. From Anonymous of Muskegon , Michigan on 12/12/2016 . Had this wine with ribs. It is wonderful. We will definitely have it again.